Nickel 405 Supplier - Nickel Alloy 405 | Stainless Shapes, Inc.
With high sulfur count and similar corrosion resistance to nickel 400, 405 provides easier machinability while still delivering a strong and long-term type of metal for you to work with! As is with all Stainless Shapes, you pick the metal and have it sent to you in no time at all. Chemical Composition – Nickel 405 is predominately 63% Nickel and anywhere from 28-34% copper. This guarantees the most amount of chemical and corrosion resistance from the nickel while also maintaining the brute hardness that comes with using a majorly copper metal. Trace elements of Carbon, Sulfur, Silicon, Iron, and Manganese. This creates a formidable blended metal that is durable as well as very machinable for the needs your job requires. Corrosion Resistance – Nickel 405 exhibits many of the same corrosion resistance and physical properties as Nickel 400, however, the range of mechanical properties do not completely mirror those of Nickel 400. This grade is used primarily as automatic screw machine stock where corrosion resistance and toughness are required. 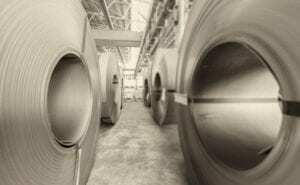 Machinability – The higher sulfur content of Nickel 405 allows for enhanced machinability, making this alloy the free machining grade of Nickel 400. Similar to Nickel 400, 405 is a high-Nickel alloy consisting of at least 63% Nickel alloyed with Copper, some Iron, and other trace elements. This material is valued by many industries for its combination of high strength and corrosion resistance over a wide range of conditions and temperatures.